We look forward to seeing you. 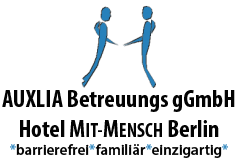 The Hotel & Restaurant MIT-MENSCH is a barrier-free, friendly hotel with a familiar flair in Berlin-Karlshorst. Most of the hotels are operated by people with disabilities. Fear of contact is a foreign word in the Hotel & Restaurant MIT-MENSCH. Helpful, courteous, friendly and with a lot of dedication.